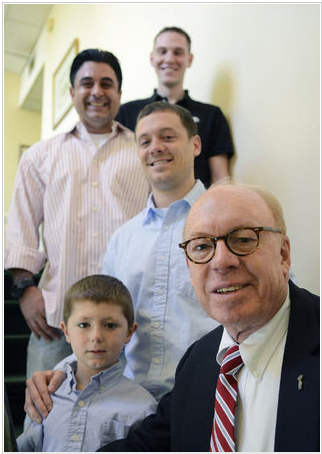 Tommy Norman (front) with some of the veterans and their families helped by Charlotte Bridge Home. U.S. Army helicopter pilot Adam Stead faced a long recovery after he was shot in the head during a flight in Afghanistan in 2009 to pick up wounded soldiers. 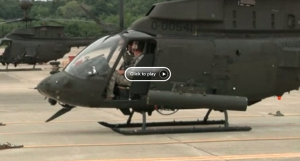 Two years to the day after he was injured, he returned to his Kiowa helicopter for the first and last time for a ceremonial final flight. A military reporter asked Stead what he was going to do next as his 10-year military career came to an early end. “That’s the million dollar question,” he said. It’s the same dilemma facing thousands of other veterans returning from Afghanistan and Iraq, many with traumatic physical injuries and mental-health problems. Fellow vet Thomas E. Norman (’66) has made it his personal mission to help Stead and other veterans start new lives in Charlotte. Since Norman founded Charlotte Bridge Home in 2011, the nonprofit agency has helped more than 475 veterans and their families bridge the gap from military to civilian life. Norman, 69, has lived most of his life in Charlotte, where his father managed a Navy shell-loading facility during World War II. He joined the Army after graduating from Wake Forest and served stateside in the special forces until 1972. He worked in banking in New York City for three years before returning to Charlotte and starting Norcom Properties, a commercial real-estate firm. In the late 1980s, Norman and two friends raised more than $350,000 to build a memorial in uptown Charlotte to honor the 101 natives of the city killed in Vietnam. Then came another call and another. Norman and his wife, Patty, were soon welcoming veterans into their home and helping them find jobs or places to live or schools for their children. As the calls kept coming, he quickly realized the need was far outpacing his efforts. With support from the Charlotte business community and Foundation for the Carolinas, he founded Charlotte Bridge Home. He serves as chair of its board of directors and a tireless advocate for giving veterans an opportunity to serve again, in the civilian world. 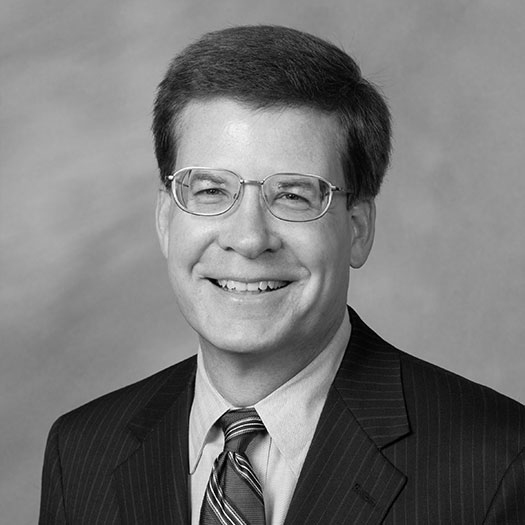 The Charlotte Observer named him among those shaping the Charlotte region on its “Seven to Watch” list for 2013. With a full-time staff of six, including five veterans, Charlotte Bridge Home helps veterans find jobs, housing, counseling, health care, and day care and schools for their children, and secure military benefits and VA services. The Office of the Secretary of Defense has cited Charlotte Bridge Home as a model veteran reintegration program. Because of its location, economy and reputation, Charlotte is a hot destination for returning veterans. The Department of Defense has told Norman to expect another 7,000 to 10,000 veterans to move there in the next few years, to join the 58,000 veterans already living in Mecklenburg County. To help veterans find jobs — their most pressing need — Charlotte Bridge Home has launched the Charlotte Alliance for Veteran Employment to encourage companies to hire veterans. Watch an interview with Adam Stead. Norman has built personal relationships with many veterans. He reached out to Stead as Stead was still recovering from his injuries at Fort Campbell, Ky. “He gave us a family and support system. My life wouldn’t be what it is today without him,” Stead said. U.S. Army Special Forces Maj. Kurt Cook, a 20-year veteran, thought he had another 10 years with his guys until he was injured in Iraq. As he recovered at Fort Bragg, N.C., from a broken neck, a brain injury and the cumulative effects of assorted other injuries suffered during three combat tours in Afghanistan and Iraq, Cook said he wasn’t sure what he was going to do next until meeting Norman. Come on to Charlotte, Norman told him.